I made another batch of banana blondies. These didn’t have a crust to hold them up, but they didn’t really need one either. I used the recipe from Smitten Kitchen and added half a cup of mashed banana like Deb suggested. The blondie batter is simple, and not very different from Melissa Clark’s, except for the proportions and the use of melted butter vs brown butter. 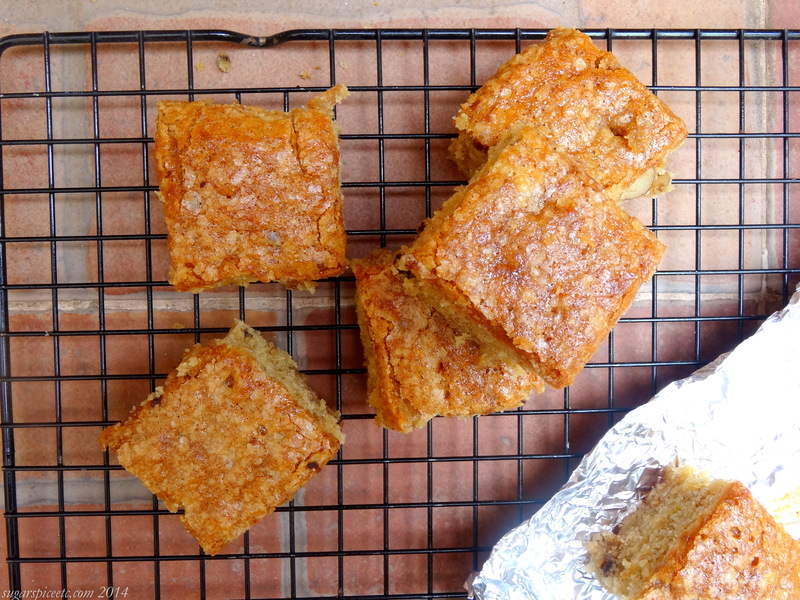 Baked as plain blondies, they appear to be quite chewy…but that half cup of mashed banana brings on the fluff. So while this recipe yields a shiny, crackly top, beneath, it’s more banana bread than fudgy. Jessica from How Sweet It Is also talks about the effect of bananas in blondie batter in a recent post. And it seems that adding bananas to batter generally fluffs things up. Her banana blondie recipe balances things out with egg yolks, which is a trick I must try. 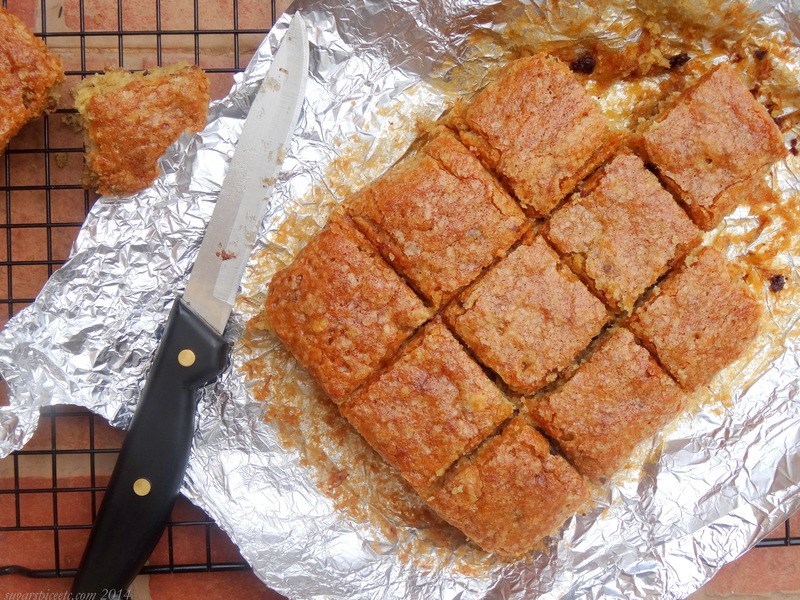 But in the meantime, here’s the recipe for a simple banana blondie. Dense or not, they’re still pretty darn good. Grease an 8×8 inch baking pan and set aside. Beat the melted butter and brown sugar until smooth. Beat in eggs, vanilla and mashed banana until evenly combined. Pour the batter into the prepared pan and bake at 175 C for 25-30 minutes, or until a toothpick inserted comes out clean. ♥I folded in about 1/4 cup of broken walnuts and chocolate chips. Very little, because I had scant quantities that needed to be used up. Hope that tummy is better now! I second the first comment. . Hear hear..